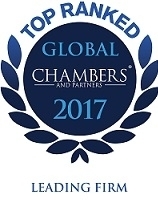 Ilyashev & Partn ers has once again won top rankings from the recently released Chambers Global 2017, being highly recognized in Dispute Resolution (Band 1) research for Ukraine. In addition, the firm’s partners achieved individual recognition and received numerous positive feedbacks from clients. Managing partner Mikhail Ilyashev acts on a broad range of domestic disputes. Clients appreciate his pragmatism and dedication: “He is an extremely responsive and hard-working lawyer with a strong business orientation,” experts say. Mikhail Ilyashev first ranked in Chambers Global in 2006, and Roman Marchenko – in 2011. Along with Chambers Global, Ilyashev & Partners is recommended by the leading international research companies and specialized legal directories: The Legal 500 – EMEA and IFLR1000. According to the survey “50 Leading Law Firms in Ukraine 2016” conducted by the Yurydychna Praktyka publishing house, Ilyashev & Partners advised in 25% of major public litigations and arbitrations.